Riverside Galleria has tried to skirt the city's review process by asking for an exemption to the law that requires building to front mapped streets. Borough President James Oddo called on the city to reject the appeal. CHARLESTON — A planned waterfront retail complex has tried to skirt city review by claiming what it previously called a street to help with traffic is simply a driveway, Borough President James Oddo said. Riverside Galleria, the 470,000-square-foot plaza proposed on Arthur Kill Road near the Outerbridge Crossing, applied for an exemption to the state law that requires buildings to place streets on the city map. "This is problematic," Oddo added. "You will see this loophole exploited again and again across Staten Island." Under General City Law 36, buildings have to front streets on the city map before they can get a certificate of occupancy from the Department of Buildings. Developers can get exemptions for hardships or practical difficulties, which Oddo said are generally granted. If the Board of Standards and Appeals does refuse the exemption, it would force the project to go through the Uniform Land Use Review Procedure (ULURP) that would require approvals from the Community Board, City Council and mayor before it starts construction. Oddo — who has railed against other projects trying to get exemptions for the law recently — called on the BSA to reject the application so it would force a study into potential traffic problems. "We are trying to protect existing communities making sure the review as intended happens before the project, so that don't we don't continue to exacerbate our traffic and infrastructure problems," Oddo said. An attorney for Riverside Galleria said in a statement that they submitted plans with the city to widen Arthur Kill Road to help with potential traffic and plan to meet with Oddo on the issue soon. "When building a world class retail center such as Riverside Galleria, it is imperative to work closely with elected officials, government agencies and members of the community," said attorney Steven Barshov. "We look forward to attending the meeting that Borough President Oddo will convene with City agencies so that compliance with [General City Law] 36 can be resolved to everyone’s satisfaction. That is now and always has been our goal." The Riverside Galleria will include retail stores, restaurants, a cafe, a dine-in movie theater with a rooftop bar and more. 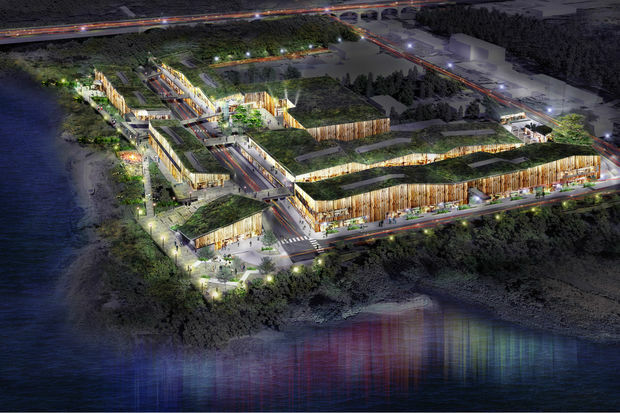 Plans also include a waterfront park — with access for cars and pedestrians to the water — and a wetland and nature preserve, developers previously said.